Theodor Hertzl, usually called Zionism’s official founder, planned the colonisation of Palestine in a more practical book, The Jewish State, 1896, which was approved by the first Zionist congress in 1897. He described Hess’s book Rome and Jerusalem as the book that says everything you need to know about Zionism. “Race”, people, nation and the chosen all merge in Zionism to create a national socialism, colonial style, synonymous with “lebensraum” and “blut und boden”. Later on, German national socialism was created with similar ideological components and with different practical effects on society. Nazism is the Germans’ national socialism and Zionism is the Jews’. Chaim Nachman Bialik, national bard of Israel, wrote this in “The Present Hour” in 1934. It may be disputed to what extent Nazism was an answer to Bolshevism or the other side of the Zionist coin. The Balfour Declaration, signed 1917 by Britain’s foreign minister and lord Rothschild, created the prerequisites for a national identity for the Jewish group through a Jewish state in the land of Palestine, in accordance with Zionism’s short-term goals. Britain gave away a country owned by others to a third party, in exchange for the cooperation of the Jewish mafia on Wall Street, partly to fund Britain’s military endeavours in the First World War and partly to get the US on the side of the British in the war against Germany. The classic speech by Benjamin H. Freedman 1961 on these matters, not to forget. There was little support for Zionism among Europe’s Jews to begin with, nor among Jews in German concentration camps during the Second World War. However, the panic-stricken exodus of Jews from Germany to Palestine was engineered by a collaboration of Jewish Zionists and German Nazis, thus blocking a more substantial exodus to other countries. This was done through cooperation between The World Zionist Organisation and Germany, the so-called Transfer Agreement in 1933. 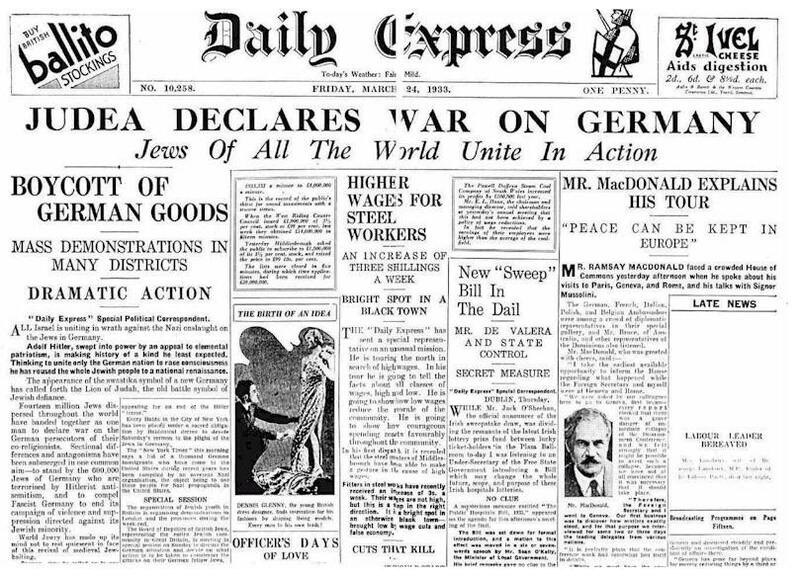 Preceding this, world Jewry had declared war on Germany in the form of a worldwide economic boycott. However, much earlier on, as part of Europe’s colonisation, Zionism, since the end of the nineteenth century, had guided the Jews in the colonisation of Palestine. Politically Zionism had its great break-through after WWII with the proclamation of the Jewish state in Israel in 1948. Eastern European Marxist Jews, lead by Ben Gurion, Israel’s founding father who saw himself as a Bolshevik, came to play a crucial part in the colonisation. The socialist kibbutzim where only Jews could become members, paved the way to the theft of land and ethnic cleansing of approximately 750.000 Palestinians in 1948, the Nakba cataclysm. These Palestinians and their offspring still live in refugee camps or in exile and are denied their right, laid down by the UN, to return. The eviction was carried out by the Jewish army Haganah helped by Jewish Zionist revisionists from the Stern and Irgun terrorist gang groups, founded by Zeév Jabotinsky who cooperated with Benito Mussolini. That same year, the Stern gang murdered Folke Bernadotte, the Swedish UN envoy and negotiator of the UN plan for partition (2). However, it was not until after the 6 Day-War in 1967 that Zionism (post-Zionism) became a significant force in the US, through Jewish influence on banking, media, the film industry, the academic sphere and the Jewish lobby organisation AIPAC, and the neo-conservatives’ (neocons) influence on US foreign policy and the neo-colonial wars in Afghanistan and Iraq. The US neocons comprise an alliance of Jewish and Christian Zionists and neo-liberal conservatives, with Leo Strauss as their foremost ideological figure. A kind of rightwing Zionism that bears great similarity to Jabotinsky’s in Palestine. But neocons also have roots among Trotskyites in the US, who like Ben Gurion in Palestine, were Bolsheviks. The Soviet Union took a very active part in the work leading up to the admittance of Israel as a member state of the UN. To what extent this was made to reinforce their influence among communists in the US who were predominantly Jews, or the first importand act of SU Social-imperialism, may be disputed. Most religious Jewish assemblies worldwide today, see Zionism as a positive development of Judaism (3). But some smaller groups of orthodox Jews such as Neturei Karta, consider Zionism incompatible with Judaism because the creation of a Jewish state can only be the work of God, not of people as in the case of Israel. Christian Zionism has considerable support in the American Bible Belt, but also Christian congregations such as The Swedish Pentecostal Movement give support. Christian Zionism is a large organisation but is subordinate to Jewish Zionism in its support of a Jewish state in Zion where the supposition is, however, that one day the Jews will become Christians (4). Today, Zionism has become the most dominant ideology in the western world and is the most significant expression of Anglo-American imperialism, and reached a new stage by ”Project for a New American Century”. The terror attack 911 became the turning-point. It was most likely an outside/inside false-flag operation, with clear israeli connections, even called a new Pearl Harbor. Zionism is used to control people’s thoughts by restricting freedoms of speech and press, and to motivate neo-colonial wars aimed at Islam. This is accomplished by presenting an official picture of “The Holocaust” as an exclusively Jewish affair and it is treated like a religion; questioning it is taboo and liable to punishment by law. Today, in many countries there are academics in prison for their criticism. The European Union is promoting economic and military collaboration with Israel. Thus Jewish power have become more visible (5). The new Hitler is any leader of a country disliked. He was said to be in Iran accused of wanting to wipe out the Jewish state in a “holocaust”, using nuclear weapons he doesn`t have but Israel does. Criticising Israel’s policies and its influence in the US is labelled “anti-Semitism”. 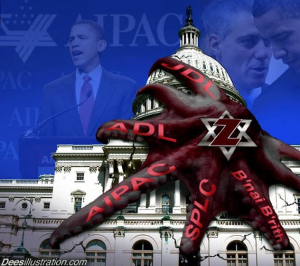 Questioning parts of the Zionist picture – 6 million Jews killed in gas-chambers – is called Holocaust denial; criticism of the Jewish mafia’s dominance within the power elite, mainly on Wall Street and The Federal Reserve, is named “racist conspiracy theories”. Considerable efforts are being made in the US and the EU to promote further restrictions and legal punishment of such criticism. It is reasonable to consider that the concerns surrounding details of Hitler’s war crimes against diverse groups of people, including the Jews, should primarily be a matter of discussion between researchers of history, in the same way that the crimes committed by Stalin in the 1930s in Ukraine during the great hunger catastrophe are studied. In Sweden, organisations such as The Expo Foundation (the Swedish Searchlight), AFA (Anti-Fashist Action), The Swedish Committee Against Anti-Semitism (the Swedish ADL), play a significant part as front organisations for the government authority Forum for Living History (FFLH) in its defence of the Jewish state and the promotion of Zionist ideology. 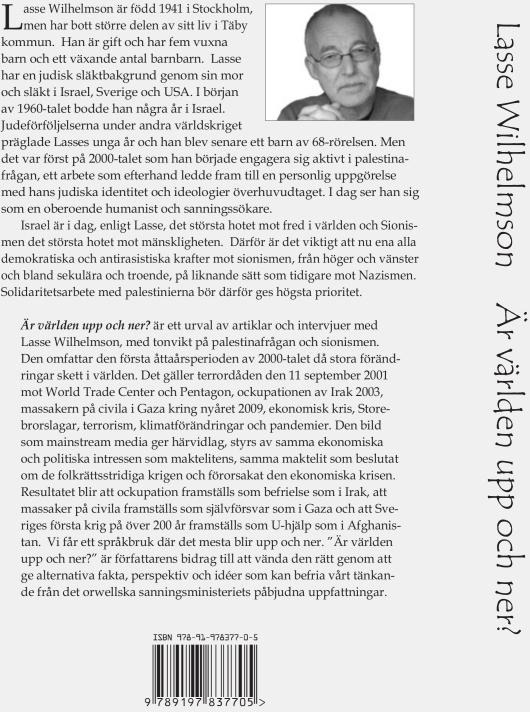 FFLH, the witch hunt and subsequent sentencing of Ahmed Rami (Radio Islam webbsite), are a few of the signs of Zionism’s influence over Sweden’s institutions of government. The business world has its equivalent in the way that the Jewish family corporation, Bonnier, influences the media. The extreme rightwing Sweden Democrats, is the political party that is most Israel-friendly, consequently also the party that launches the most aggressive attacks on Islam. Spreading information about the destructive influence Zionism has on humanity in today’s world, and in Sweden, is predominantly an ideological struggle against control and manipulation of people’s thinking. Especially since Zionism hardly exists in public debate. And the reason for this is that the means of production of culture and ideology are to a great extent owned or influenced by Zionist interests. The heavily nuclear-armed Jewish racist settler state Israel is today the greatest threat to world peace through its influence in the western world, and Zionism is the greatest threat to humanity, including the majority of Jews. Zionism is used by the power elite in its efforts to secure a new world order with one Big Brother state and continual conflicts and wars between various religious, ethnic and cultural groups from disintegrated national states. In this light, Israel is the capital of the world and the Palestinians are the oppressed peoples of the world. Hence, Zionism is dangerous and must be resisted. 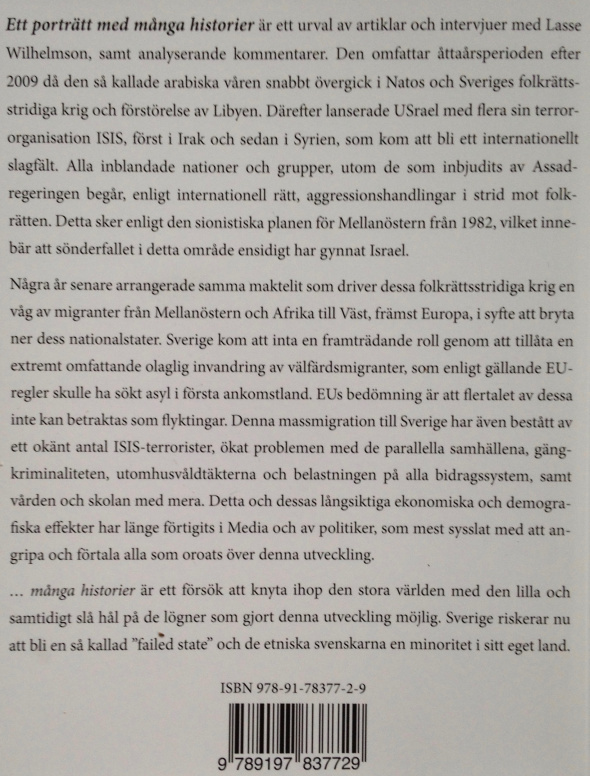 The Anglozionist power elite´s latest Bogeyman ISIS/IS which exploded the last year is analyzed in a separate article by this author after a research visit in the Middle East in the spring of 2014. 1) It should be stressed that although Zionism is a Jewish national socialist project, while Marxism is an international socialist project open to all, both can be seen as Jewish projects, as can the neocons, because of the dominance of Jews in the leadership of these projects. Karl Marx was not a Zionist, but nevertheless Moses Hess was his personal stand-in at the meetings of the Internationale in 1868 and 1869, 6 years after having written Zionism’s Magnum Opus: Rome and Jerusalem. 2) Marxism and Zionism can be seen as complementary survival projects for Jews in Europe, lasting a hundred years, from the middle of the 19th century up to the middle of the 20th century – a double faced tribal strategy. Zionism created the necessary conditions for a nation for the Jews, while at the same time Marxism reduced the strength of all other nations through its internationalism. Regardless of whether this came about intuitively, or was launched as a conspiracy by the Freemasons, or Moses Hess planted the seeds or it was a combination of all these and other factors, the tangible result was that the Jewish group was reinforced. To such an extent that even Hitler and Stalin’s attempts to reduce its influence failed. We see today, that these strategies were successful regarding Jewish power, especially in the West, and in post-Zionism’s role in the neo-colonial wars. The fact that the majority of Jews are exploited by the Zionist power elite does not alter this fact. 3) Religious Jewish assemblies today, for example in Sweden, consider that a person born of a Jewish mother, who does not belong to any other religion, is religion-wise a Jew. It is also possible to convert to Judaism. But many who consider themselves Jews are in fact secular. Being a Jew today then, is primarily a question of taking on board an identity that is tied to the Jewish state and “The Holocaust”, and sometimes also religious conviction. Every individual Jew can choose to be or not to be a Jew. 4) Judaism, Jewish mentality and Zionism are conceptions with fluid boundaries. They are connected but must at the same time be kept apart. This is because of the diverse opinions amongst religious Jews about Zionism, and because the number of non-Jews influenced by Jewish mentality and Zionism is much bigger than the number of Jews. Modern research has shown that Jews are neither a homogenous ethnic group or a people in the common meaning of the word, but rather, instead, a scattered group held together by a common tribal mentality and religious rules (Halakha) that give guidance as to how matters stand with non-Jews (goim) who, in this context, are considered less than human. Final words: This article is a try to relatively short and simple sort out what Zionism is, and some related questions – from Moses Hess to today. Of course there are some questions to add, primary about the impact of the Culture Marxism emanating from the Frankfurt School and mass migration to Europe. I am glad to receive comments for the next update. But don´t miss the links.